The FAS/V-Series VASA Provider is a software component that supports the VMware VASA (vStorage APIs for Storage Awareness) framework, first introduced in vSphere 5. It acts as an information pipeline between NetApp storage systems and the vCenter Server, enabling you to monitor relevant storage system status. FAS/V-Series VASA Provider collects data from your storage systems and delivers information about storage topology, LUN and volume attributes, and events and alarms to the vCenter Server. 2) After it is downloaded, move the VASA provider to your server. Double-click netappvp-1-0-1-win64.exe > click Next > Next > Install. Make sure Launch VASA Configuration is selected and click Finish. a) On the VASA Configuration window, in the upper left, enter your vCenter user and password and click Save. b) On the right under Storage Systems, click Add. Add your storage systems that provide NFS or VMFS datastores to vCenter. c) Under VMware vCenter, enter your vCenter FQDN, user and password and click Register Provider. Click OK on the VASA Provider Has Been Registered pop-up window and click OK to close the VASA Configuration window. 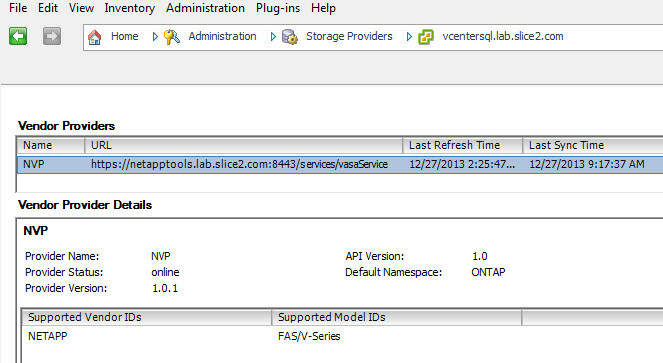 Make sure the NetApp VASA Provider service is running by checking the status light shown as green. If it isn’t, manually start the service in Start > Run > services.msc. 3) Log out of vCenter and then log back in. 4) In vCenter, click View > Administration > Storage Providers. Under Vendor Providers, select NVP and the details will display below. 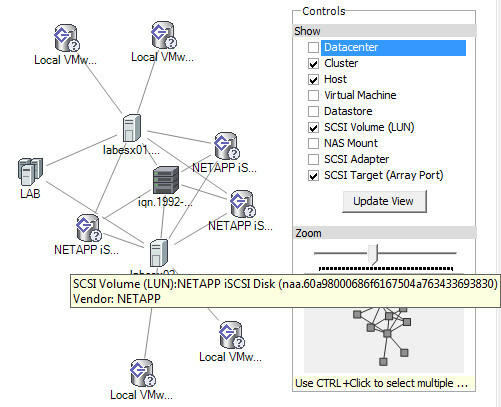 5) Click your Cluster > select the Storage Views tab. On the upper left of the Storage View tab next to View, click Maps. Your NetApp luns will be identified as such. 6) To see all of the storage profiles, click View > Management > VM Storage Profiles. At the top in the middle select Manage Storage Capabilities. The items with type “System” are now available. You are using Storage Profiles right? 7) Click View > Inventory > Datastores and Clusters. 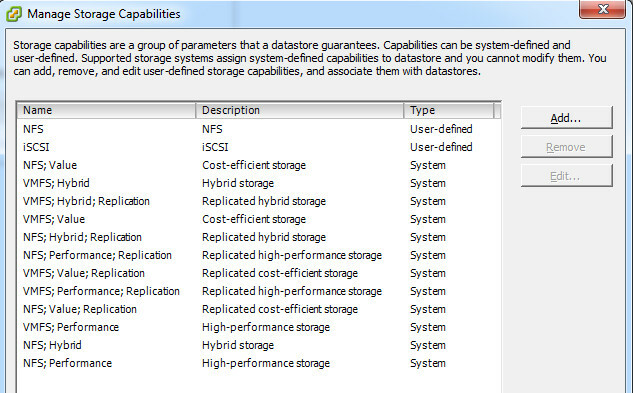 Select an NFS or VMFS Datastore provided by the NetApp array. On the Summary tab under Storage Capabilities, you should see System Storage Capability for that datastore. If you click the little blue call-out icon, the Storage Capabilities Details pop-up window appears.